Most social networking sites, like Facebook or MySpace, are safe to use. However, because of their popularity, criminals are using them to spread malware. There are various methods they're using - like sending spam messages, luring to download malicious file, etc... Sometimes it may appear that a message is posted by your friend, but in fact, it's malicious. - does the message look legitimate? Watch out if this is the first time you've received a notification with such a text! - move the mouse over the link and look if the link really goes to Facebook - http://www.facebook.com (the address should appear at the left bottom part of your browser window). - does it contain an urgent request to provide any information or change your password? Be suspicious of any messages like that! Note: you can report fake email notifications here. 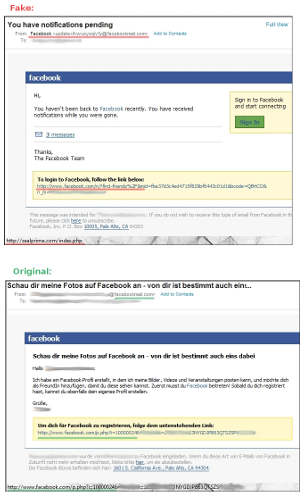 Some spam samples - fake social media e-mail notifications: Social Network Attacks Surge (Symantec blog). 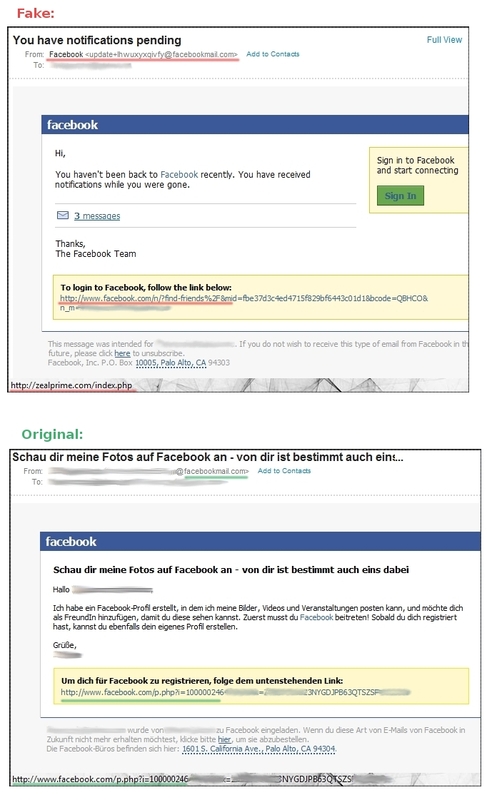 - Facebook Worm - "Likejacking" (SophosLabs blog) - instructions on how to remove the spam messages from your Profile at the bottom of the article. So why do they go through all of this trouble? In a word – MONEY! What the scammers don’t want you to know is that each time someone completes one of their silly surveys they get paid. Some of the scams require you to provide your name, address, date of birth, cell phone number, etc. This information can be used by marketers, hackers and identity thieves to wreck havoc in your personal and financial life. enable login notifications: also available in the "Account Security" settings - "when a new computer or mobile device logs into this account, send me an email or a text message"
use one-time passwords: "Simply text "otp" to 32665 on your mobile phone (U.S. only), and you'll immediately receive a password that can be used only once and expires in 20 minutes. In order to access this feature, you'll need a mobile phone number in your account." For additional security, consider using Login Approvals: it is a Two Factor Authentication system that requires you to enter a code we send to your mobile phone via text message whenever you log into Facebook from a new or unrecognized computer.